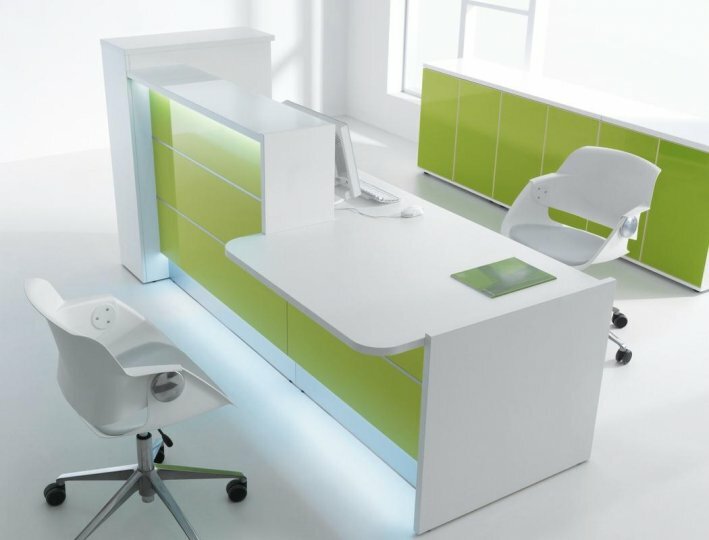 Modular reception desks that are modern and stunning with high gloss laminate fronts. 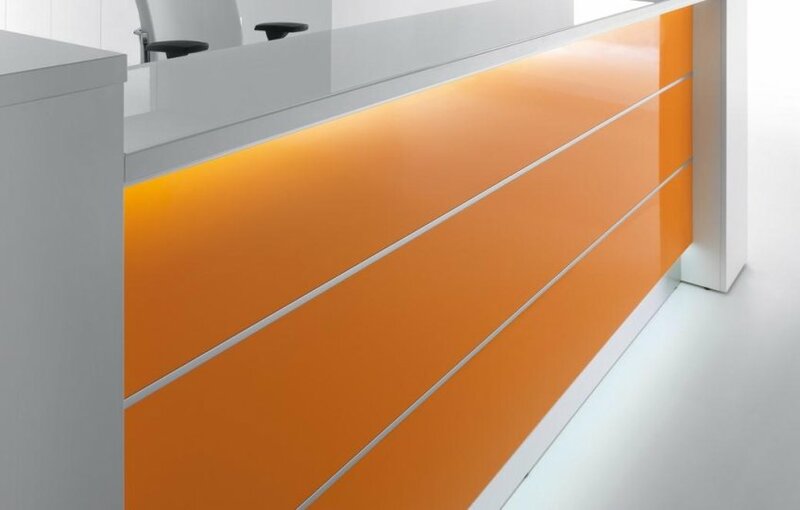 These reception desks have an optional LED lighting feature incorporated beneath the counter and footrail to produce a visually stunning effect. End panels or cupboards support the desk and are in a White finish as standard with alternative finishes available if required. Valde is manufactured to an outstanding quality in Europe on a lead time of 3-4 weeks and is supported by a five-year factory warranty. If you look at any successful business, you will be sure to find almost all of these will have a professional, warm and inviting reception area in their office, they have a reception. The reason that companies invest a lot of money in making sure that these areas are high spec is that this area is were people visiting your company will form their first impressions about your business, and you will want to make sure that these impressions are positive. Fully refurbishing your reception area can really help boost your businesses image and reputation as well as make you more appealing to work with regards to clients. The Valde range is manufactured in Europe to an extremely high specification and is available for a free delivery to anywhere in mainland area. When redesigning your reception area you firstly want to start with the colour scheme. You will need to make sure that the colours work well together and do not clash. A good place to start, when thinking about the colour scheme is to begin with perhaps using your own brand's colours to help give your reception some kind of identity and brand to the office. Once you have worked out the colour scheme you will then want to think about the reception furniture. You want to make sure that not only do you have a reception desk that is clean and professional, but that you have a reception seating area that looks stylish as well as provides comfort for the users. We provide our own in-house, professional design and space planning service in support of this reception desk range and can provide 3D visuals in support of our proposals for your entire reception area. All that we need from you is the dimensions, quantity and style of reception desk. If you would like to take advantage of this free design service then please call our sales team on 01823 663 880.